When you are injured in a motorcycle accident in Royal Palm Beach, be wise and consult an experienced Palm Beach motorcycle injury lawyer before taking any action toward damages recovery. Leave the legal work to the expert and keep your focus on your physical and emotional recovery. If you happen to be injured in a motorcycle accident in Royal Palm Beach, call our Royal Palm Beach motorcycle accident attorneys at the Wolfson Law Firm for assistance. We will help you determine if you are entitled to compensation, and if you are, what your options are going forward. You'll have injury-related expenses and financial losses throughout the recovery procedure, so it is in your best interest to get advise sooner than later. However, do not accept immediately any settlement offers made by insurance companies. They are rarely what you deserve for your harms and losses. Instead, call us for a free consultation at 305-285-1115, and we will let you know what's the fair amount of money for your case. You won't pay us fees unless we represent you and recover for you. Having in mind the injuries you could sustain after these accidents, you may claim damages recovery for medical bills, medication bills, scarring and disfigurement, lost wages, loss of financial support, funeral costs, emotional pain, and other injury-related costs and expenses. After the initial consultations, we will investigate all the important circumstances of your case. We will work closely with your doctors and witnesses to gather all the necessary evidence to build a persuasive case. When we build it, we will make a settlement package for the insurance company and will leave them reasonable time to respond. If they accept it, good! You've got the compensation you deserve. If not, we will file a lawsuit and if necessary, go to trial. Royal Palm Beach is a wonderful village in the Palm Beach County in South Florida located 15 miles inland of the Atlantic Ocean. It is widely known for its efforts to preserve green spaces, so it abounds with parks and recreational spots. Moreover, it is located next to the Pond Cypress Natural Area. It also borders with Golden Lakes on the east, Loxahatchee Groves on the west side, Loxahatchee on the north and Wellington on its south. This village grew very quickly in population. In 2000, it had 21,000 residents. In 2010, the number grew to 34,000, while today's estimation ranges around the number of 38,000 residents. 85% of them have English as their first language. The median household income is at $55,000. 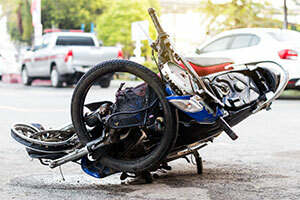 In case of an motorcycle injury, don't hesitate to call our bilingual Royal Palm Beach motorcycle accident attorneys at the Wolfson Law Firm for help. We are available for free consultations at 305-285-1115. We don't ask for fees until we recover for you.